The world’s most versatile encoder evolves. The Cube 600 series is the latest addition to the Teradek family of encoders. 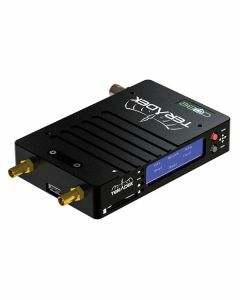 The new Cube 605 and 655 builds upon the success of its predecessors and features several significant upgrades including a new dedicated embedded network processor that supports GigE for higher bitrates, enhanced 802.11ac Wi-Fi for longer range, dual HDMI/HD-SDI inputs, and built-in bonding with ShareLink™. This new addition to the Cube line aims to provide the next generation of versatile encoding for independent content creators and professionals alike. Cube provides ultimate portability by distributing live HD video to iPads and iPhones for producers, clients, and others on set. Supporting up to 5 iOS and/or Android devices, users can view the feed at an increased range with Cube 655’s robust 802.11ac Wi-Fi. In addition to local playback, the new Cube 600 series integrates Frame.io’s cloud-based review and dailies workflow, ultimately enabling collaboration with entire teams anywhere around the world.